Over half of adults in the United States live with a chronic illness like diabetes or asthma. If you’re one of the lucky few that doesn’t have a chronic illness, odds are you know someone who does. You probably also know that adults with chronic illnesses usually spend a lot of time visiting different doctors and health care facilities trying to manage their symptoms. But what you might not know is that these patients are sometimes stigmatized in healthcare settings. This can have a negative impact on their quality of life. If you felt like your doctor had negative feelings about your illness, how likely would you be to seek treatment? And if you don’t seek treatment, would that harm your quality of life? Well, Valerie Earnshaw and Diane Quinn wanted to study just that: Does stigma in healthcare settings impact people living with a chronic illness? They thought that if a person experiences more stigma, they would be less likely to access healthcare. And as a result, this would lead to worse quality of life. If we can understand exactly how stigma affects people, we can work towards forming strategies to ensure that people with chronic illness access healthcare and have the best quality of life possible. Unlike other studies on chronic illness stigma, Earnshaw and Quinn defined three distinct types of stigma and looked to identify which type of stigma had the worst impact on individuals. Internalized stigma occurs when people absorb or “internalize” negative attitudes about their stigmatized attribute. Experienced stigma is pretty self-explanatory: It’s just when someone perceives that they’ve been discriminated against in a healthcare setting. Internalized and experienced stigma could lead to anticipated stigma. That is, if someone has experienced stigma or internalizes stigma, they’ll probably expect this stigma in healthcare settings in the future as well. All three types of stigma may be related to each other and are all connected to care access and quality of life. Earnshaw and Quinn thought that the more someone internalizes stigma about their illness or experiences stigma, the more likely they’d be to think others will do the same in the future. As a result, they would anticipate that they will experience stigma in the future. They also thought that people who anticipate stigma would access less care, and then have a lower quality of life. So, all 3 types of stigma have an impact on care access and quality of life for the chronically ill community. Earnshaw and Quinn recruited 184 participants through an online survey. The majority of these participants were white/European females who had either asthma, some type of inflammatory bowel disease (like Crohn’s or ulcerative colitis), diabetes, or some type of chronic pain disorder. The participants were then asked some questions about internalized, experienced, and anticipated stigma and whether they’d experienced any of these forms of stigma in healthcare settings. Here’s the big picture: Earnshaw and Quinn were right. But just in case you actually DID want to see the numbers, look at the figure below. Just like they thought, the data showed that internalized stigma and experienced stigma were related; the more a person experienced stigma, the more they internalized stigma. Both internalized stigma and experienced stigma in healthcare settings lead to anticipation of stigma in healthcare settings. So, the more you experience stigma or internalize stigma, the more likely you are to think you’ll be stigmatized in the future. Internalizing stigma was found to be directly related to care access and quality of life. The more someone internalizes stigma, the less likely they are to access health care. And if you’re not accessing healthcare when you have a chronic illness, your quality of life is lower. The same went for those that anticipated stigma. People that anticipated stigma accessed less care. 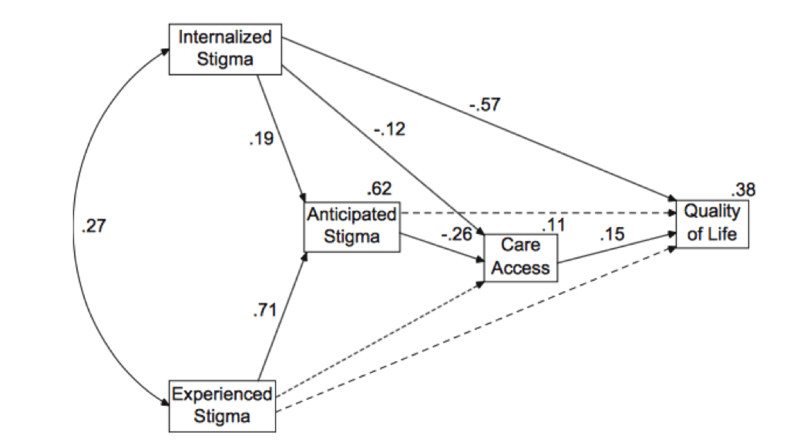 Interestingly, the data also suggested that the relationship between anticipated stigma and care access was stronger than the relationship between internalized stigma and care access. This means that people may be more influenced by the stigma they anticipate in the future rather than the stigma they internalize. But, there were some limitations to keep in mind. First, this sample doesn’t represent the whole population of people living with chronic illnesses. Most participants were females and in their early 20s. The chronic illnesses they reported didn’t include some of the illnesses more prevalent among older adults such as heart disease and cancer. We need to look at more research to see if Earnshaw and Quinn’s findings are true for the rest of the population. Well, chronic illness is on the rise among Americans and over half of adults are currently coping with at least one. This research is really important to help understand what influence stigma has on the quality of life for this population. When these individuals seek out care and experience, anticipate, or internalize stigma about their illness, they may not be comfortable reaching out to get treatment. And without medical care, the symptoms of chronic illness may take a serious toll on their overall quality of life. If we can begin to eliminate stigma in the healthcare setting, we can ensure that living with a chronic illness doesn’t have to mean that someone will live an unsatisfactory life. Earnshaw and Quinn think that early intervention can help to take away the internalized stigma these people deal with and that way, they won’t hesitate to access health care resources and improve their quality of life overall. 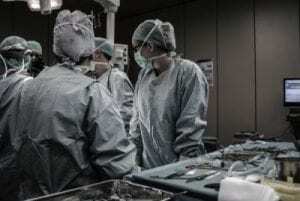 Providing information and tools to make healthcare workers more aware of the negative impacts of stigma would also be a useful way to ensure that stigma won’t have such negative consequences for people with chronic illnesses. Earnshaw and Quinn think that by encouraging self-efficacy, patients will be more likely to keep up with their healthcare visits. Because the number of people diagnosed with a chronic illness increases everyday, a better understanding of how stigma impacts quality of life is necessary to ensure that the needs of this growing population are served.